NurseGrid requires you to add a worksite to your account before adding any shifts. This makes sure that you're able to access all the great features of NurseGrid, including giving away shifts and messaging colleagues. 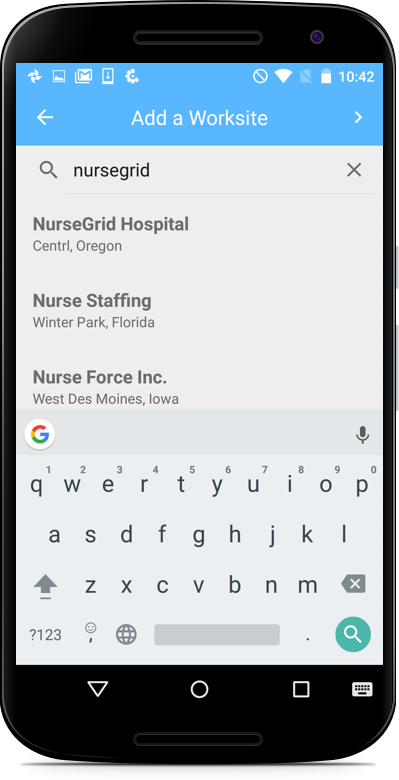 When you first sign up for NurseGrid, you'll be brought directly to our worksite search function. Search there for your worksite and department to add them to your account. If you don't see your worksite, shoot us a note with the facility name, city, and state at support@nursegrid.com. To add additional worksites, head to the Me tab by pressing the Me button at the bottom of your screen. Tap "Worksites," then press the "+" icon in the top-right corner. Search for your facility and tap it when it appears, then pick your department. The worksite will then be added to your Worksites list.